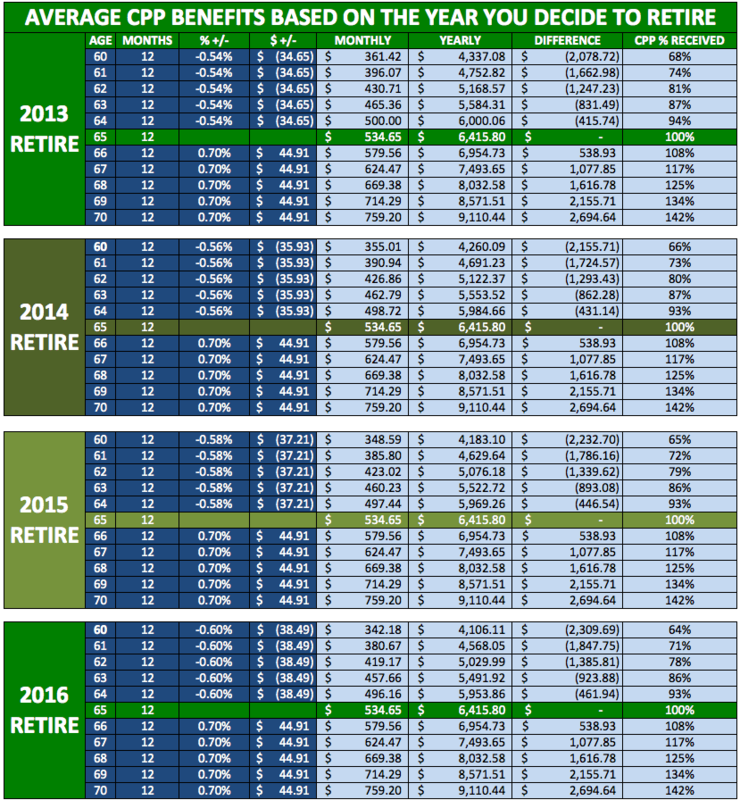 When should you “retire” and start taking Canadian Pension Plan (CPP) Benefits? | Save. Spend. Splurge. Home › Money › Canada › When should you “retire” and start taking Canadian Pension Plan (CPP) Benefits? When should you “retire” and start taking Canadian Pension Plan (CPP) Benefits? As someone who is thinking about retirement at an early age, the Canadian Pension Plan (CPP) has always been a bit of a mystery to me. I know it exists, I know I paid into it when I worked for a salary the few years I worked, but I have no idea how it works and what I’d get. WHAT ARE THE DIFFERENT AMOUNTS OF CPP I CAN GET? WHAT IF YOU APPLY FOR THEM EARLY, AT 60 – 64 YEARS OF AGE? You get a percentage deducted. The site says you lose about 36% of your CPP pension by taking it early. WHAT IF I APPLY FOR THEM LATE, AT 70 YEARS OF AGE? You get a percentage ADDED to your CPP receipts up until the age of 70. 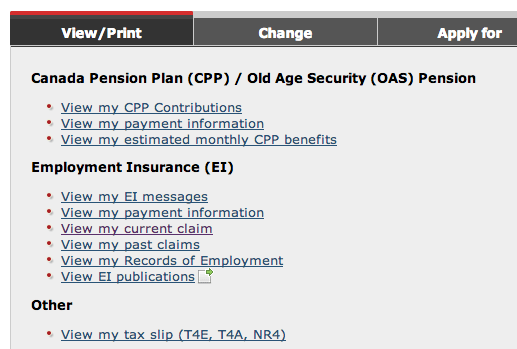 The site says you gain about 42% of your CPP pension by taking it late. Here is the above information in a handy chart form I whipped up for you. Note: I believe it’s correct, but they’re rather confusing on the site but the percentages of loss or extra bonuses based on what they say, confirm the amounts in the last column with CPP % received. If you’re close to retirement, you just pick the year you want to retire and look at the age you’d retire at. So let’s say you decided to retire in 2013, at the age of 60. You’d lose about $2078.72 a year, but you’d get about $32,258.64 in early income over the years of early withdrawal that you could use. If you withdrew it all at 70, you’d gain about $2694.64 a year, and you’d get an additional $46,578.71 for your patience in waiting in total, even though it isn’t early income in hand. SO WHEN SHOULD YOU TAKE YOUR MONEY? It’s hard to say when you should take the money. I would probably suggest not taking it earlier than 65, but not to wait too long past the age of 65, if you don’t think your health will hold up or you have a shortened lifespan based on family history. WHEN WOULD I TAKE THE MONEY? I don’t pay into CPP as a freelancer, so I’m sort of just theorizing in this regard (I am not banking on having any CPP when I retire). I take my salary in dividends and rely on myself to save money to cover my retirement plan when I get to that age. So for me, my CPP would be practically non-existent, and I wager, not even up to the average of $534.65 a month. HOW DO YOU CHECK FOR YOUR CPP BENEFITS? Once you have either of those codes (EI or PAC), then you can use this link to register and logon to Service Canada to see your statements. After you log in, it shows you two options: You can either log in with a “partner” which is a bank that you register with, or you log in with your GCKey (Government of Canada key). This GCKey is in NO WAY the same key you use to look at your Canada Revenue Agency (CRA) tax statements and info online (pretty dumb right?). This is just your Service Canada Key. You can certainly make the name and password the same as your CRA key, but just don’t think it’s the same thing. Surprisingly, there’s something there, check it out! I guess I could “count” on $368.61 in the future if I were 65, but I think as I age, and as my CPP contributions get smaller in the overall picture due to my age (plus INFLATION! ), this might be only really be $50 in the future. Not counting on it anyway, I’m assuming it’s $0. WHAT CAN YOU EXPECT IN RETIREMENT?